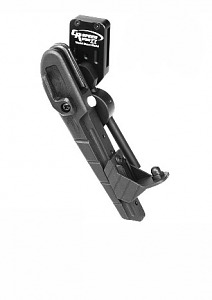 The WSM 2 is the result of refinements in the previous CR Speed Holsters. The World Shoot Model 2 offers the sport shooter simple adjustments for an exact fit for most Production Division, Open Division and Limited Division pistols. The CNC machined, anodized aluminum Versa-Hanger will fit 1.5" belt loops and provides for a secure mount, yet exceptionally fast draw. This high performance holster is fully adjustable to provide you the best cant and draw angle to suit your personal needs. Will fit Smith and Wesson M&P models. I placed my order on 5/13/14 and received it 5/15/2014! The holster was easy to setup for my S&W M&P .40 Pro 5" and is ready for this weekends match. Thanks for the great service and fast shipping, I'll be shopping with you again!